The queen also told Martin McGuinness she had been kept very busy celebrating her two birthdays. IT HAS BEEN a rough few days for Britain, but its monarch seems fairly good humoured about it all. Commencing her two-day visit to Northern Ireland yesterday, Queen Elizabeth cracked a few pointed jokes as she met Deputy First Minister Martin McGuinness. 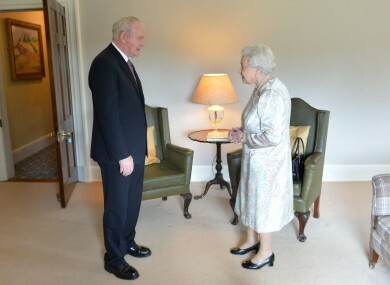 “Hello, are you well?” McGuinness asked as he extended his hand in greeting to the monarch in a televised meeting. “I’m still alive anyway. Ha,” Queen Elizabeth laughed, shaking his hand. We’ve been quite busy. There’s been quite a lot going on. It was not clear whether her comments were in reference to political events in Britain or to her two birthdays, which she told McGuinness she had been busy celebrating. The queen has not issued any statement on Britan’s vote to leave the EU. After an audience behind closed doors with the queen, McGuinness, who has called for a vote on Irish unity, refused to comment on whether they had discussed the referendum. “We discussed many things, none of which I will tell you,” McGuinness said. - © AFP 2016 with reporting by Michelle Hennessy. Email “'I'm still alive anyway' jokes Queen Elizabeth on visit to Northern Ireland”. Feedback on “'I'm still alive anyway' jokes Queen Elizabeth on visit to Northern Ireland”.